British Prime Minister Theresa May, left, arrives for an EU summit at the Europa building in Brussels, March 23, 2018. European Union leaders have given their unqualified backing to Britain over its accusation that Russia used a nerve agent to try to kill former double agent Sergei Skripal and his daughter Yulia in southern England earlier this month. The two victims remain hospitalized in critical condition. A policeman first on the scene, who also was infected with the nerve agent, was discharged from the hospital Thursday. Speaking Friday at the EU summit in Brussels, British Prime Minister Theresa May offered gratitude for the bloc's solidarity against Russia. "The threat that Russia poses respects no borders and it is a threat to our values," she told reporters. The EU ambassador to Moscow has been recalled as a symbolic protest. Several European governments — including Lithuania, Poland and Denmark — are looking to expel Russian diplomats. Germany and France have raised the prospect of further measures. "We have said very clearly that we view this as a serious challenge for our common security," said German Chancellor Angela Merkel. 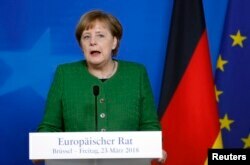 German Chancellor Angela Merkel attends a news conference at a European Union leaders summit in Brussels, Belgium, March 23, 2018. Moscow has repeatedly denied involvement and accused the European Union of following an "anti-Russian campaign launched by London." "Unfortunately, the Russian side does not have a chance to receive any firsthand information on the so-called Skripal case," Kremlin spokesman Dmitry Peskov said at a press conference Friday. In little more than a year, Britain will officially leave the EU. Some question whether it can rely on the same level of EU solidarity in the future. Professor Anand Menon, with the "UK in a Changing Europe" program at Kings College London, said, "No one has an interest in unpicking our security cooperation. What I do worry about is the medium term. That is to say, if these negotiations go badly, if the trade deal isn't very good, what might well happen is that each side engages in blaming the other. "And if you imagine a situation where Britain leaves without a trade deal, our economy gets badly hit, one possible side effect of that will be growing anti-Europeanism here. And then I wonder whether our solidarity with our European partners will be easy to maintain." Talks can now begin about what that future relationship will look like, after EU leaders rubber-stamped a post-Brexit transition period until December 2020. "The prospect of a cliff-edge at the end of December 2020 looms large, because most people who know anything about international trade think it is unlikely, if not impossible, that we see a trade deal negotiated and ratified between now and the end of December 2020," Menon said. Britain will be looking to strike new trade deals outside the EU just as signs of a new global trade war emerge. U.S. President Donald Trump announced plans Thursday for tariffs on $60 billion of Chinese imports in retaliation for alleged intellectual property theft. 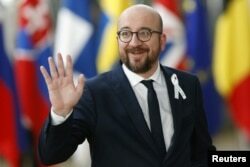 Belgium’s Prime Minister Charles Michel waves as he arrives at a European Union leaders summit in Brussels, Belgium, March 22, 2018. Europe was given a temporary exemption on Washington's proposed tariffs on steel imports, pending negotiations. EU leaders voiced anger that the exemptions aren't permanent. "It gives the impression that there is in the head of the United States a will to negotiate with the European Union by putting a gun to our head. It is not a loyal way to negotiate when we are such historically solid partners," warned Belgian Prime Minister Charles Michel. European leaders also discussed relations with Turkey amid concern over its military operations against Kurdish forces in the Syrian city of Afrin. In a further sign of worsening relations, the EU also condemned what it called Turkey's continued illegal actions after clashes over gas and oil exploration rights off Cyprus. Ankara and Brussels are due to hold a summit Monday in Bulgaria.